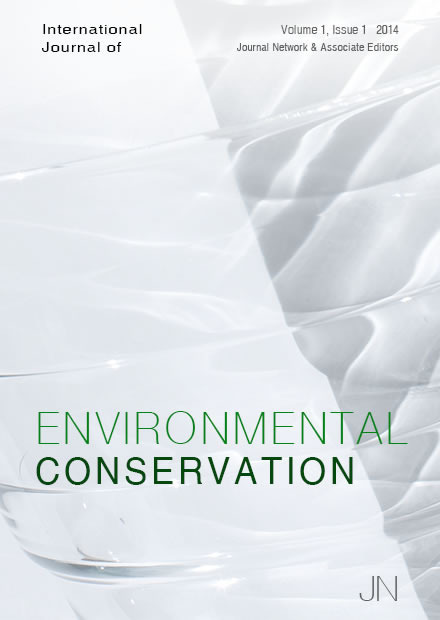 The International Journal of Environmental Conservation is a peer-reviewed, open access journal that publishes original research articles, review articles, and essays related to environmental and conservation studies. The scope covers ecosystem research and reporting, international and domestic policies, sustainability and biodiversity. Papers, articles, and all other manuscripts must be submitted by one of the authors of the paper, and should not be submitted by another person on the author's behalf. The submitting author takes responsibility for the paper during the submission process. Please note that the International Journal of Environmental Conservation levies a paper-processing charge on all accepted papers. Most open-access journals rely on author charges to offset the costs of managing the journal. Only a single portable document file (PDF) document is accepted. Please include all illustrations, figures, and so forth in the document. The document should be in a full-text format of good quality, for indexing purposes. PDF documents saved as images (where the text cannot be highlighted) cannot be indexed by services such as Google Scholar. If you are using Microsoft Word, OpenOffice, Apple Pages, or Google Docs, simply save the paper as a PDF to preserve its full-text format. Different papers require different formatting styles; for example, scientific research papers will differ from historical essays. Please format your paper using a standard convention or style. The Abstract of the paper is a summary of what the paper is about. It should not exceed 350 words. If a research paper, please include relevant background information, results, and an the potential implications of the paper. Include 3-8 keywords representing the main content of the paper. Separate each keyword with a comma. The main text of the paper. It is the author's responsibility to follow a clear and (where possible) standardized format for the paper. Please include references or citations (if any) after the body of the paper, or in the page footers, in a numbered format. APA or MLA format is recommended. The International Journal of Environmental Conservation encourages authors to include supporting data sets (if applicable) in an appendix at the end of the paper. Do not submit data as an additional file. The International Journal of Environmental Conservation is based on a model of instant distribution, editorial transparency, and continuous peer-review. A submitted paper undergoes a two-stage referee process. The purpose is to minimize time delays between submission and publication, and to promote ongoing conversation and paper refinements between authors and reviewers. In stage 1, the paper is either accepted or rejected by the managing editorial team, usually within a week. If the article is accepted, it is published immediately in the journal. In stage 2, the journal's associate editors are notified of the publication, and can provide additional public reviews of the paper. Associate editors must apply to the role, and provide a detailed curriculum vitae to indicate their qualifications in reviewing the paper. Authors are encouraged to upload revised manuscripts based on the reviews of the associate editors. Both papers and reviews can be endorsed for their scholarly merit, rigor, and relevance to the field. Endorsements are displayed on author and editor profile pages, to provide a real-time rating system of their scholarly contributions to the journal. The International Journal of Environmental Conservation is indexed by Google Scholar, and are registered through Ulrich's Serials Directory. ISSN/SISSN numbers are listed for older library systems. We do not offer print subscriptions at this time. Qualified scholars are encouraged to become an associate editor of the International Journal of Environmental Conservation, and help review submissions. You must have a background in the field to qualify. Full professors, associate and emeritus professors, researchers, graduate students, professionals, and others are welcome to apply, but the decision will be based upon the curriculum vitae in your profile. Decisions are made by the managing editors. Your application will be sent to the managing editors. When a decision is made regarding your application, you will be notified by email. In stage 2, the journal's associate editors are notified of the publication, and can provide additional public reviews of the paper. Authors are encouraged to upload revised manuscripts based on the reviews of the associate editors. Associate editors are encouraged to provide detailed, constructive reviews that will help the author(s) improve their manuscript, and help readers evaluate the paper. Key issues are whether the work has serious flaws, or whether there are additional experiments, data, considerations, or treatments required to support the conclusions drawn. Where possible, editors should provide references to substantiate their comments. All reviews are publicly visible; however reviewers may use the private messaging system to communicate privately with the author or other editors in service of improving the paper. Authors are encouraged to submit revised manuscripts based on these reviews and other editor input. Both papers and reviews can be endorsed for their scholarly merit, rigor, and relevance to the field. Endorsements are displayed on author and associate editor profile pages, to provide a real-time rating system of their scholarly contributions to the journal. You will be notified by email when new submissions to the International Journal of Environmental Conservation are published. You can edit or delete your reviews in the Edit Review section of your profile.